01What is surgery for lovebands? The surgery for loveband gives more volume to the flesh that protrudes under the eye and makes the eyes cuter and more attractive. In the eyes of many celebrities, it looks attractive and charming because below their eyes they have a bit of volume. It is an effect caused by the thick muscle bulk of the Orbicularis Oculi Muscle under the eyelashes when they are laugh. Having volume under the eyes brings brightness with a little smile. Adding volume under the eyes became popular among entertainers and it has now become a popular trend. This can be achieved by various methods. There is microscopic self-fat transplanting(fat injection), an filler injection like Restylane, Alloderm as artificial thick tissues and so on. When curing hang down skin, the process uses the same method as eye bag plastic surgery and the volume under the eyes is made by using self thick skin or muscle tissues. 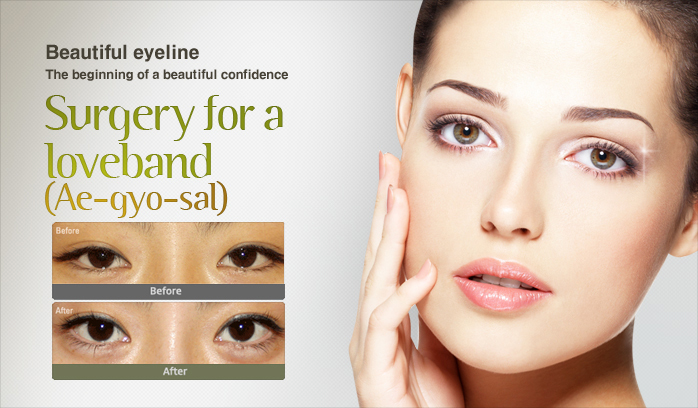 Alloderm surgery is a method of adding Alloderm by creating a 3mm incision in both sides of a lower eyelid. It is completed in 20 minutes and stitches are pulled out after 3-4 days. Swelling continues for 2-3 days after an operation, but then looks natural after a week. In fat injection, ones own fat is extracted from unnecessary area like in the hips, arms, the sides of thigh by using a thin cannula and separated into healthy fat by centrifuge and is inserted into the loveband portion under eyes.